Despite the recall, these are still great little seats. The main reason some kids are getting hurt is due to parents ignoring the safety instructions, placing the child in precarious elevated spots like a table or counter. Hopefully, the safety strap will prevent kids from squirming their way out of the chair and taking a tumble. If you pick up a Bumbo seat at a future garage sale, don't forget to contact the company for the free seat belt they are offering to consumers. After reading this article I wondered if the news of the recall would put a damper on Bumbo sales? Checking on eBay, it seems the recall hasn't affected current prices. A quick scan of completed listings show pre-owned Bumbos are still selling in the mid-twenty dollar range. 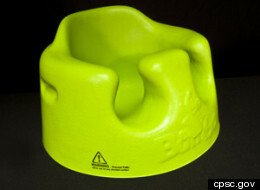 Even better still, Bumbo seats with the snap-on trays can average $30 dollars or more on eBay! This is about what I've sold them for prior to the recall announcement. Prices vary depending on condition and color. As you can probably guess, pink and blue seem to be the most popular colors. So don't let the news of this recall slow you down. When you see a Bumbo seat at your next garage sale-buy it! I loved Bumbo seats for my kids and pick them up for resale when ever I can. It's a shame more people don't use common sense and things have to be recalled unless they are 100% idiot proof. Thrifty Momma-Exactly, I was going to work the "dumb" parents reference in my piece but deleted it. What parent would put a kid up precariously high in their Bumbo seat? Gee-whiz, Why not just sit him/her in a little bucket and hope for the best? It's funny you posted this because I literally just ordered the repair kit about an hour ago. I have my son's old bumbo to sell, and he could squirm out of it pretty easily so it always stayed on the ground, and thought that a way to market the item for more $$ would be to say that I'm including the repair kit with the item. My questions is: If we knowingly sell an item that's been recalled, is there a liability risk between us and the buyer should anything happen? I hate to point out the elephant in the room, but I think it would be good to know our risk in selling an item that has been recalled. I plan on selling the bumbo on a local FB buy and sell page or craigslist because I'm so afraid of eBay's hands-off approach to representing sellers. Yvette-When it comes to legal advise, you're going to get what you pay for from me! Ha! My "opinion" is that any product you sell on eBay could potentially injure a buyer. However that doesn't mean you are liable for that product. That falls on the manufacturer. As an example, if you sold a Ford Pinto on eBay and the gas tank blew up when your buyer drove it, would you or would Ford Motors be liable? I would think Ford would be dragged into court. Also, If there is a safety issue with a product, eBay is going to ban it from their site. If eBay starts blocking Bumbo chairs sales, then there is definitely a legal issue out there. Lastly, if you are concerned about liabilty, you can copy/paste the recall and safety instructions in your lisitng so the buyer can't say you did not inform them. But again, I am not an attorney, that's my "opinion". You should consult with an attorney on this if you are concerned about any liablilty issues. Thanks! I completely agree with your point of view. Working in government full time has made me so much more aware of how much people sue nowadays and for the dumbest reasons. A crack in the sidewalk and they trip and fall...they sue. Nevermind if they were texting on their cell phone while walking at the same time. Just trying to err on the side of caution when it comes to recalled items so that I'm not at risk. Thanks for the great blog. I really enjoy reading your posts about your sales and great finds. Yvette - Thanks for the compliment, I am glad you're enjoying the blog. We do have a new development in the Bumbo chair recall-check Laureney's comment below. Could be trouble! I'm just irked b/c they took down MY bumbo posting b/c of the recall, yet there are soooooooooo many more on there. Anyone else had this happen? Laureney- I see what you mean. There are a bunch listed an I only found one that said it came with the new safety belt. That's pretty arbitrary of them! You might want to call Ebay's Online Customer Support line and ask what gives? If you do call them, write back in and let us know what lame excuse they gave you...Good luck....Dude! I received a message from the CSPC people themselves (through ebay) stating the recall, the day after the recall occurred. I jumped on ebay just to see if they were still selling and if there were bumbos still listed and sure enough there were. I decided to just wait it out to see what would happen and not 3 days later they took my bumbo off. It just seemed so random to me, at least they did warn me. But, I just don't understand why there are so many on there still? It's just a weird deal, yo! I also love your blog :). I got that same message from CSPC (via ebay)a few days ago, and so I just added to my listing that I would mail the repair kit to them. My bumbo didn't get taken off, and I just sold it this morning. I am just going to have the repair kit sent straight to the buyer. Laurney- I would follow feetinwater's lead (above) and call Bumbo for the safety belt. Then re-post it stating you'll be sending the belt along with the chair. But you're right, it is random and makes no sense. Good copy/paste solution, you're providing the buyer with the info, straight from CSPC so there's no misunderstanding. Thanks for writing in....Dude! I am glad you posted this Dude! I think I have two or three Bumbos in the garage that I have not had a chance to sell yet. As soon as I read your blog, I ordered the two repair kits (the max is two that they allow you to order). I am going to play the safe side and wait for the kits to arrive and then sell the seats with the kits and add the recall info to my description. It just seems to be the best (safest) way to do it. GSA Three in storage? That's money in the bank! I discovered that two belt limit when I logged onto their site. Blogged about it this morning....Dude! I just received my recall kit today. Just curious if others are going to actually install the kit or just include it for buyers to install. Thanks for that great question....Dude!